Home » Stories & Experiences » I hope you have a BOY! I hope you have a BOY! 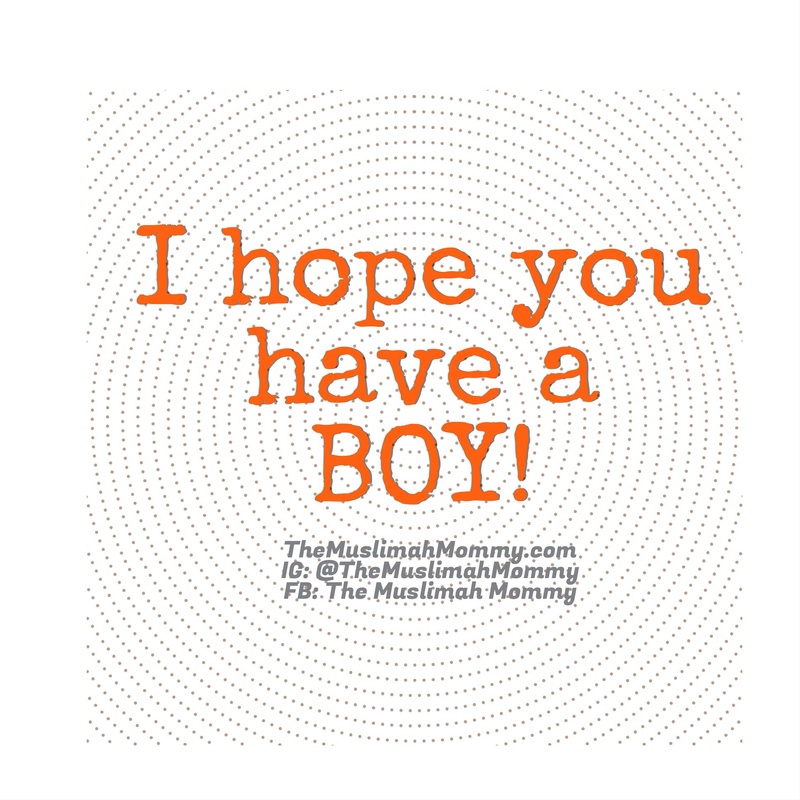 “I hope you have a BOY,” is a phrase I heard too many times during my pregnancies. I mean…really? I had my children in 2007, 2011, and 2012; and with each pregnancy came those individuals that not only hoped, but prayed that I would have a boy. These ‘hopes’ and ‘prayers’ never bothered me while I was pregnant with my first child, and I happily smiled in response to the phrase, “I hope you have a boy.” In fact, I would often thank people after they would say this, and I would politely tell them that I wouldn’t mind having a girl or a boy. I was a college student during my first trimester of pregnancy, and quite petite in size; therefore no one at school knew I was pregnant. For the remaining months of my pregnancy I was surrounded by my family members. My family is from Pakistan, so I wasn’t shocked when I heard my relatives saying they hoped I would have a boy as my first-born; after all, growing up I witnessed favoritism towards males within the family. I didn’t even respond to the comments, although I did bite my tongue so hard on some days- I was sure it was going to bleed. At this point, I had a healthy and beautiful daughter who was a pure blessing! I was also working full-time in a financial institution, surrounded by great co-workers from various backgrounds. I was ALSO surrounded by clients who, much like my family members, were hoping my second child would be a BOY. I mean, now that I had a girl, I NEEDED a boy to “complete” my family…right? WRONG! A. Who said any gender completes a family and B. Who says I’m planning to have only two children? I was surprised that these two reasoning’s came out of the mouths of people from different cultures and religions…this was an eye opener- I now had learnt that this ‘boy’ thing wasn’t just a ‘Pakistani’ thing…it was a universal thing! Sigh…! I have to say that initially I was quite surprised by the comments, and gave out a slight fake smile in response. Eventually, I informed my clients that I would love to be able to give my daughter a sister, for I had five younger sisters myself and we had a blast growing up together. Well, here I’am with two daughters and one son…and now people ask me if I’m done having kids because now I have my ‘BOY,’ and now my family is ‘complete.’ Oh wait…I still get people who ask me if I will try for a fourth, that way our family will be ‘balanced,’ you know because then ‘hopefully’ I will have two girls and two boys?!?! Ummmmm….really? I have to say that during my pregnancies, especially while pregnant with my second child, I was able to group people into two categories: Group A consisted of people who just thought it would be nice for me to have a boy because I already had a girl; when I told this group of individuals that I didn’t mind if I had another girl, they would simply smile and say “awww, that’s nice.” Group B, however, consisted of individuals who REALLY wanted me to have a boy because (according to them) my family truly wouldn’t be complete without one. When I told THIS group that I wouldn’t mind having another girl, I usually heard “But still, it would be nice if you had a boy,” in response. Shortly after my third child was born, I couldn’t help but evaluate everything. Here I was- born, raised, and living in Canada with Pakistani roots; not being able to agree with my family’s perspective on the importance of having a son, yet my fellow Canadian citizens were carrying that same perspective as my family. Very few people understood my thoughts, and this shocked me. What is wrong with society? Now, I know if I had two boys, I would have had people ‘hoping’ and ‘praying’ for me to have a girl- and this bothers me too, especially when it comes from people within Group B (as mentioned above). Likewise, it also bothers me when I see lists of things attached to one gender, for instance ’10 things you can do with your son that you can’t do with your daughter.’ I’m not even kidding, these lists exist and they are so silly! On the list are playing sports and buying toy cars…sigh! Both of my girls love playing sports, and yes, I have bought them toy cars! I ask again, what is wrong with this society? And yes, there are lists for girls too that tell you girls are different from boys because they play with dolls and like to dress up. Well guess what? My son loves to play with dolls and he loves to dress up as well- take that society, your lists are INCORRECT! I’m ending this post asking society why there is a need to have a specific gender to complete a family, why must we have a ‘boy’ or a ‘girl’ to feel like we have the perfect family? Why can’t we be happy with whatever God gives us? Why do we have to make parents feel bad because they don’t have a child of a certain gender? And lastly, when will this all change? *This post was written before I had my fourth child, another boy. Now, people tell me that my family is complete and that I don’t need to have any more children, sigh! Dear society, I will decide if I want more children or not, YOU will not- thanks! May Allah Bless you and your beautiful family, ameen. I always repiled:Allah ta ala will give me what he want and i will not complaine. Thanks for your comment sis 🙂 Alhumdulillah for everything! We will receive whatever Allah has planned for us, and we should be grateful for each blessing. Ha ha,yeah don´t worry.I also turned out to be a nice and normal human being.At least my husband say so. So funny and true. People really do enjoy projecting their opinions, especially when it comes to pregnant women. Good read. Thanks. slmz. i relate to the writer and this article. my first two babies are girls, 5 and a half, and two years. when i was pregnant with my third baby, i got the same comments about getting a baby boy. my reply was the same, whatever Allah swt wills and i will be happy. Alhamdulillah my third born, yusuf, is now 7 months old. I think people need to start minding their own business. Have u ever heard people predicting gender of the baby based on how your tummy looks and or what you like to eat (sweet or spicy)? It was amazing how everyone was so convinced I am going to have a boy and my daughter surprised them:D we kept gender surprise for the main day.